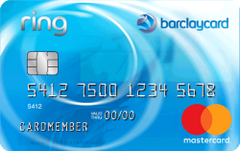 The Barclaycard Ring Mastercard features a long 15-month introductory period for balance transfers, plus very reasonable fees and a relatively low regular APR once your introductory period expires. In addition to a very low purchase APR, the Barclaycard Ring Mastercard features a low cash-advance rate, no foreign transaction fees, no penalty APR and a slew of features that are not found on any other credit card on the market today. On the other hand, the card doesn’t offer a traditional rewards program to appeal to point collectors, or a zero percent introductory offer. The low APR on this card is not sufficient to recommend it over other cards that offer a zero percent APR for a year or longer. The lack of a zero percent introductory APR for new purchases is the primary downside of the Barclaycard Ring card. The card does offer a very low regular APR of 14.24 percent (variable). However, for a cardholder seeking to save money on interest payments, it’s not low enough to compensate for the lack of an introductory offer. Many cards on the market offer a zero percent APR for 12 months or longer. Unless you expect to carry a debt for an exceptionally long period, you could save hundreds of dollars in interest by applying it to one of these cards instead. On the plus side, the Barclaycard Ring card does offer a 0-percent APR on balance transfers for 15 months, for balance transfers made within the first 45 days of account opening. This is a longer-than-average introductory period for a balance transfer offer, and, even more appealing — you can rest assured once the introductory period expires that you will have a low regular APR and reasonable rates and fees. Note, though the Barclaycard Ring card normally doesn’t charge a balance transfer fee, you will have to pay a 2-percent fee (or $5, whichever is larger) for balance transfers made within the 45-day window. On the plus side, the remainder of the fees and interest rates on the Barclaycard Ring card are very reasonable. While other cards typically hit you with an APR exceeding 25 percent for cash advances, the Ring card offers a very low cash-advance APR of 14.24 percent. There is a low fee of $3 for cash advances and no fee for balance transfers done after the first 45 days from account opening. Cardholders may find the lack of a foreign transaction fee especially useful. The majority of credit cards charge around a 3 percent foreign exchange fee when you use your credit card abroad. Not this card. When you pay with Barclaycard Ring card, your final price will be the same as paying with cash. While Barclaycard Ring is not a rewards card, you can still get rewarded via the Giveback program. Note that this is a profit-sharing program, not a rewards program, and there are no specific reward rates. Whenever a card member uses the card, a percentage of the transaction is set aside in a pool available to all card members. Once the amount in the pool reaches a certain threshold, the funds become available and all members receive a share of it. According to the program’s terms and conditions, the program and the profit-sharing features are offered at Barclay’s “sole discretion.” While it’s nice to get something back for buying things you need anyway, you shouldn’t apply for the Barclaycard Ring card if you are interested in reward points or cash back. One standout feature of the Barclaycard Ring card is the Barclaycard Ring Community. This is a unique feature, which allows members of the community an opportunity to voice opinions and vote on product changes. For example, the decision to get rid of the foreign transaction fee was voted on by the community. Aside from these few unique features, the card is lacking in perks. While cards with low interest rates typically don’t come with many frills, the Barclaycard Ring card is particularly pared down, boasting only an EMV chip and free monthly access to your FICO credit score. Why get the Barclaycard Ring Mastercard? You don’t care about an introductory APR for purchases. You often travel abroad and want a card with no foreign transaction fees. Saving money on credit card interest and fees is more important to you than rewards. You want more of a voice in the features that come with your credit card. Always pay more than the minimum payment due and try to pay as much as you can, despite the low APR. When you use the card abroad, always decline the so-called “dynamic currency conversion.” When a merchant asks you whether you want to pay in dollars or local currency, choose the local currency. Otherwise, you may be charged 5 percent or more for an unnecessary service.